The purpose of this mini-ethnography is to evaluate the consumption of coffee amongst Michigan State University students in the East Lansing area. Coffee has been a widely-consumed beverage, but the underlying perceptions, customs, and trends of coffee consumption have been shown to vary cross-culturally (Hayward 1904). East Lansing, home to Michigan State University, provides a concentrated environment of college students with adjacent academic and commerce-oriented areas. We seek to observe the patterns, customs, and purposes central to the coffee consumption of our research participants. 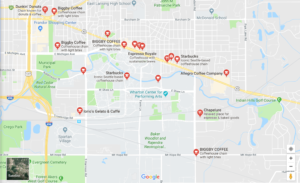 Map which shows the locations of various coffee shops in the East Lansing area. Not featured are establishments which don’t exclusively sell coffee, such as McDonalds. Photo from Google Maps. According to the United States Census Bureau, East Lansing has a total area of 13.67 square miles. The population as of the 2010 census was listed at 48,579, while Michigan State University’s enrollment for the 2017-18 academic school year is listed as 50,344. The median age in the city was 21.6 years, and 62.4% were between the ages of 18 and 24 (US census). For the purposes of our study, we decided to evaluate the areas proximal to the Michigan State University (MSU) main campus, where the concentration of students is greatest. Between the boundaries of Park Lake Road to the East, Saginaw Street to the North, US-127 to the West and Mt. Hope Road to the South, we found a listing of 19 coffee shops/cafes. These businesses were identified as deriving a primary source of revenue from coffee, tea, and other beverages, and in some cases baked goods. Fast food restaurants that sell coffee were included. Of these firms, 5 are located on the MSU campus; 3 Starbucks, 1 Biggby Coffee, and 1 Tim Horton’s. Michigan State University also maintains a chain of 21 convenience stores named “Sparty’s” that sell coffee, as well as a web of dining halls and vending machines with coffee beverages available (Eat at State). To collect our data, we employed direct observation paired with archival research. We conducted a series of 4 interviews with college students, and traveled to local coffee shops to observe their social and cultural dynamics- including the type of space provided by the coffee shop, the people using it, and how it was used. We, a team of 3 MSU students ourselves, believe that our findings and assumptions might be swayed by our predispositions and perceptions towards how college students value coffee. This fieldwork was carried out for a duration of roughly 2 months during the 2018 academic spring semester. The self expression through an MSU student’s coffee drink transcends that of its function, displaying individuality and cultural importance. 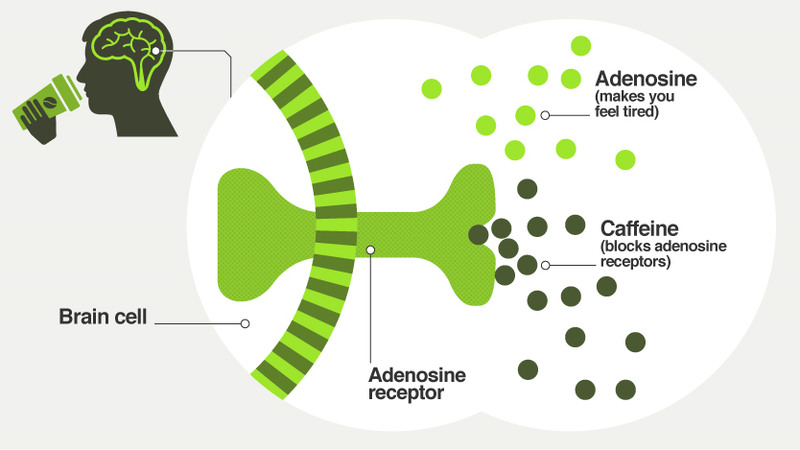 A diagram which shows how caffeine molecules inhibit adenosine ones from bonding to receptors. This in turn leads to an enhancement in cognitive function. Photo from BBC.com. What do we mean by the function of coffee? In this mini-ethnography we are referring to it as the beverage’s ability to affect cognitive function. The primary substance which accomplishes this task in coffee is caffeine. Caffeine is a crystalline compound which acts as a stimulant in the central nervous system. When an individual consumes coffee, the caffeine is absorbed into the bloodstream and travels its way up to the brain. Once in the brain, the caffeine molecules bind to inhibitory adenosine receptors, preventing them from binding to other receptors in the brain (Healthline 2017). This in turn leads to a stimulant effect, leading to increased energy levels, mood, and various aspects of cognitive function (Healthline 2017). Our interviewees stated that increased cognitive function was one of the reasons why they consumed coffee, as the following quotes indicate. Even with these well documented negative effects, our interviewees believed that drinking in moderation can prevent these effects from developing. Even though the functional aspects of coffee were a large reason why our interviewees consumed the beverage, our research shows that there are various other reasons why people consume coffee, which go beyond enhancing one’s cognitive abilities. Coffee beverages are typically served in basic forms, including lattes, iced coffee, and hot coffee. These drinks are highly customizable, and students tend to find methods of diversification and preference for how the beverage is consumed. Coffee consumers have an increasing number of customization options available to them. The pumpkin spice latte is an example of the many modifications coffee consumers can request for upon purchase. Photo by Alyssa Wauldron. 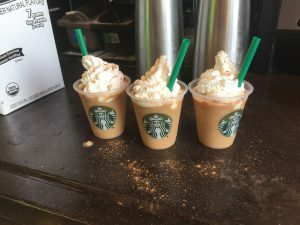 Intricacies within coffee drinks for college students include items such as type of roast, flavors, added shots of espresso, milk additions or substitutions, and more. Students reflected on this in multiple of our interviews. “I still like the taste [of coffee],” an interviewee said, “I still like the taste, and I’m very particular about having the correct ratios of cream and sugar. I like my coffee sweet, rarely black.” This informant definitely prefers modifications to consume their coffee. Even as so many modifications are available, however, another informant illustrated the seemingly sub-level to which these customizations are available. Even if a student prefers milk in their coffee, an entire subset of choices exists in the majority of East Lansing coffee locations. “At all the places around here, except Biggby, I think, normal and skim milk are served, as well as coconut, almond, and soy milk. There are a lot of choices to make.” By selecting these intricacies to drink their coffee beverages, students display that coffee is not solely consumed for the utilitarian value of caffeine, but to increase the personal and experiential value of their coffee creation. In our interviews, we asked participants when and how they drink their coffee, what forces have influenced them over time in how the began to drink coffee, and how their preferences are reflected in the context of their coffee drink contents. Modifications are also used to illustrate the need of the utilitarian qualities of the drink at the time. Many interviewees stated that beverages for utilitarian value were most often modified with few and simple ingredients. One informant speculated, “I’m not really picky on what kind of coffee, but I don’t like black coffee. So some cream and sugar or some type of creamer I like. I only like a certain type of coffee when I’m getting up really early so get a double shot of espresso. That’s the only specific thing I have in my coffee.” This individual specified their lack of interest in the specific roast, but need for added espresso, cream, and sugar. Finally, another informant emphasized the change in modifications in relativity to the need of the beverage. “If it’s out of need for caffeine, it’s a quad ristretto over ice.” This individual resorted solely to drinking straight espresso, without the use of added ingredients, for the benefits of the caffeine. Finally, intricacies of coffee beverages (i.e. the roast, origin, additions, toppings, etc.) creates a different experience for consumers. Many consumers report having different preferences in drinks depending on the scenario or their settings. “Out of luxury [my drink is] this stupid drink of a grande white mocha with one and a half pumps white mocha with soy… with whipped cream.” Another person examined the difference between their preferences based on the need and context of consuming the coffee drink. “I only drink coffee for function if I have to wake up before 9:00 AM but generally I drink it because I enjoy it. I like getting pumpkin spice whatever’s or fancy stuff from Starbucks.” Some beverages are viewed as utilitarian, while others are perceived as luxury or social items. Generally, coffee purchased outside of the home in a coffee shop is a luxury item, whereas coffee brewed at home generally serves a utilitarian purpose. A consumer makes this distinction between utilitarian and luxury item because purchasing coffee is an unnecessary expense for someone that has their own coffee maker. It is only justified if drinking the coffee is done to serve a broader purpose. When one of our subjects was asked why she drinks coffee, “…99% of the time i have it from my keurig because i need the caffeine” Then asked about spending habits, “Well i have one cup per day, and with k-cups that maybe adds up to $20 per month”. $20 translates to roughly $0.67 per cup, while a similarly-sized grande starbucks coffee (regular) would cost $2.39 in the East Lansing area. The markup this subject would pay to buy her coffee at Starbucks as opposed to brewing it herself at home would be roughly 350%. that served as a cultural epicenter featuring political debate that would be a foundational part of the 1960s american counterculture (NCA 2018). In 1972, Mr. Coffee released the first home-drip coffee maker, making a morning cup of joe accessible to anyone who could afford a machine. Several years later, in the early 1980s, Howard Schultz would recall strolling down the streets of Milan, Italy with the ability to buy coffee from a cafe on nearly every corner. As director of marketing, he sought to expand Starbucks to a similar scale, but after disputes with the owners he left for a different chain. After wild success, he purchased Starbucks in 1987 and started opening a new store at a pace of 1 per workday well into the early 2000s (Starbucks, n.d.). 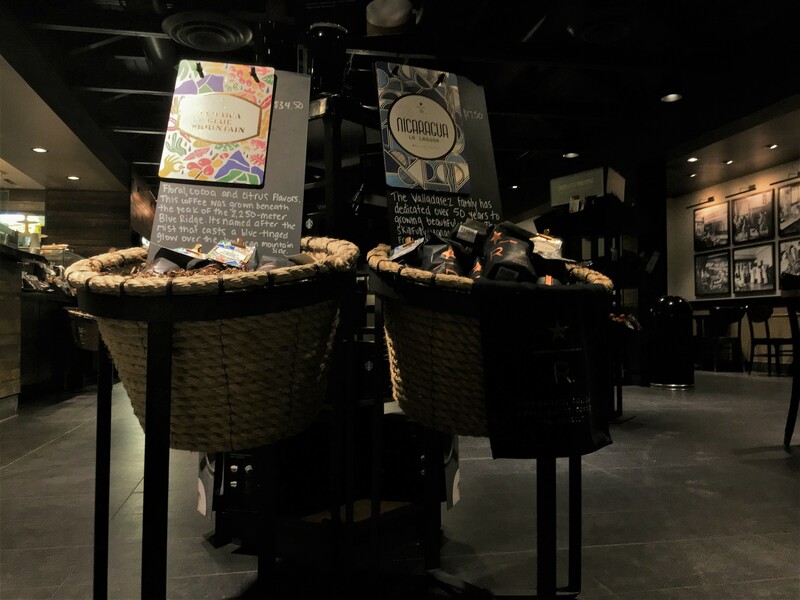 Today, Starbucks sells not only brewed coffee, but an assortment of coffee drinks as well as tea, breakfast items, pastries, and their own line of coffee beans, mugs, and small gifts. 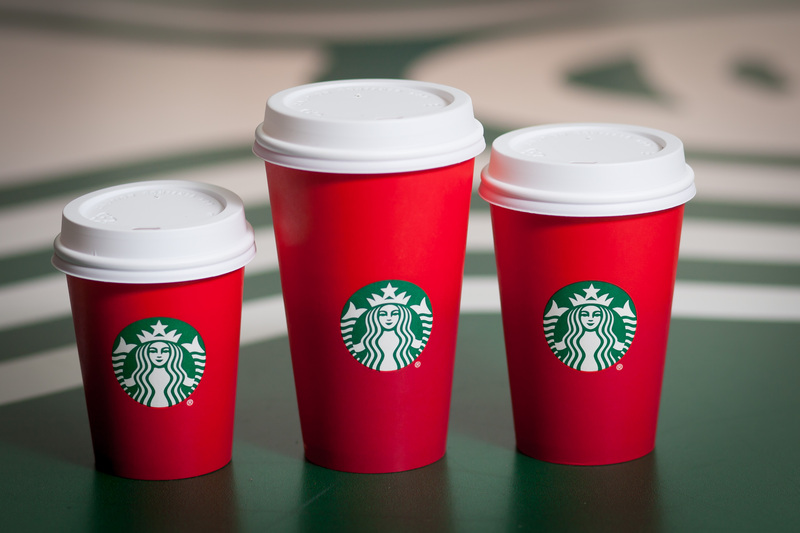 Starbucks cups are revered by some with such great magnitude that special-edition holiday cups have ensued public debates in recent years- with the 2015 blank red design deemed a “War on Christmas”. Starbucks was accused of being anti-christian by some, while others praised the decision (Wattles 2015). In a statement released by Starbucks at the height of the controversy the company said it wanted to , “create a culture of belonging, inclusion, and diversity” meaning for the cups to present a blank canvas for customers to “tell their christmas stories in their own way” (Stack 2017). The cups have been centered in political debates between social-media users and even presidential candidates. It is clear that coffee is as central to American life, and the MSU campus is no exception. For MSU students, coffee exhibits social, as well as practical qualities, and the sociability of coffee in public spaces is also changing. A trip to the coffee shop is akin to the joyriding teenagers of the 1960s, or a trip to the mall with the family on Sunday’s in the 1970s. The ideation of a stop by the local coffee shop is synonymous with “hanging out”. Language has adapted to provide clear meaning to the question “Want to go for a coffee?” to mean more than an invitation to drink caffeine. It represents an invitation to participate in what is perceived as the one of the most rudimentary parts of American sociability, something we would argue is as deeply embedded as cultural components like hand gestures, greetings, manners, and other social customs. MSU students frequently recalled “hanging out” with friends often implicitly assumes a trip to a local coffee shop. The development of the coffee shop as a social arena as well as a place of business is especially apparent in East Lansing. One of our subjects affirmed the sole purpose for the origination of her coffee consumption was related to the social pressures to maintain adequate social presence as her friends started getting licenses and frequenting Starbucks locations after school. This stayed with her into college, and now Friday afternoons are ritualized as the coffee shop trip amongst her and her social group. She explains, ”My friend and I get coffee almost every weekend in the summer, or sometimes Friday afternoons- purely for socializing”. “Grabbing a cup of coffee” serves as a common code for initiating social relationships, whether it be a date or getting to know a colleague from work. It provides a medium through which people seek to connect, compete, debate, and pass time. The common recognition of the coffee shop amongst our subjects as an appropriate – even necessary – social arena highlights a role analogous to an incubator, serving as a fruitful space facilitating the growth and maintenance of social relationships, often crucial to establishing social credibility amongst respective circles. The various coffee drinking habits exhibited by our interviewees show that they share many of the same customs and preferences, however they also express their own level of individuality. One of the habits demonstrated by several of our subjects was the morning cup ritual, where they would consume a cup of coffee if they had to wake up early in the morning. Without their dosage of caffeine in the morning, our subjects reported that they felt sluggish, and had difficulty staying focused in their activities. Another habit our interviewees had was to consume coffee due to the social aspect associated with the beverage. The social aspects behind coffee consumption are one of the driving forces behind the popularity of the beverage. Drinking coffee can give you a chance to get to know one another, catch up on each other’s lives, or talk about different kind of things (Masters of Media). Grabbing a cup of coffee with a friend allows the individual to temporarily put everything aside, and just enjoy the moment. Several of our interviewees expressed similar views regarding the social nature of coffee, and they believed that it led to increased consumption. People learn processes and habits over their lifetimes, and coffee is no exception. Like other behaviors, many of these coffee habits exhibited by our subjects were learned from other people, particularly their family members. Witnessing their parents demonstrate the same coffee consumption behavior on a regular basis led the subjects to pick up many of these habits and incorporate them into their lifestyle. These heavy influences were the reason why some of our subjects began to consume coffee, indicating that coffee is an example of informal enculturation. Dark Aesthetic which is prevalent in smaller coffee shops. Photo by Alyssa Wauldron. The spaces we observed also varied across each shop and clearly reflected the target-markets associated with them. Espresso Royale was decorated with contemporary art, leather couches and wooden table tops, paired with dimmed lighting and constant music playing over the speakers. We saw that most people here typically appeared to be studying, sometimes alone, but normally in groups of 2-3. We also noted a job interview taking place, a group of customers huddled around a laptop watching a movie, and acquaintances running into each other and chatting for a few minutes in line. A closer investigation revealed the underlying functionality that many of our subjects found in their beverage was not only utility, but the use of the space that was purchased along with it. This was reflected in a Starbucks Coffee location which we observed. 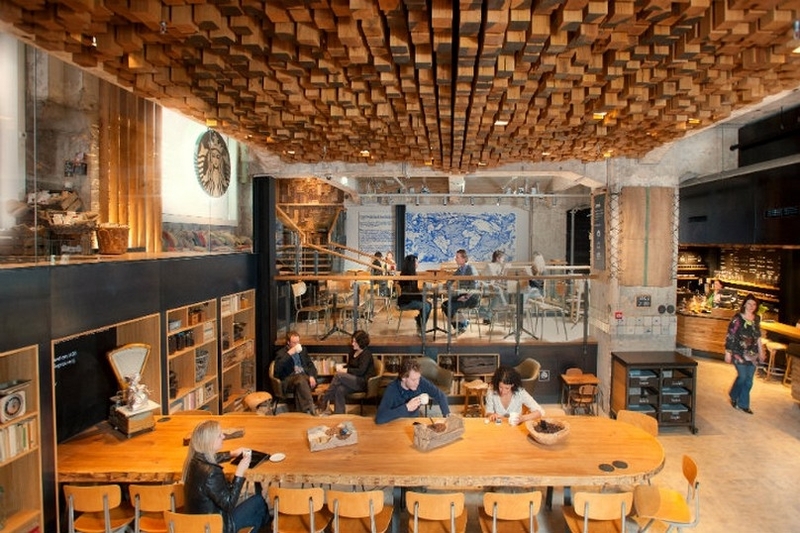 Starbucks locations around the world are designed in a way to create a “third space.” Photo by NYTexas.com. While the cafe appeared to be designed for the easy flow of guests into the queue, along the espresso bar, to the pickup counter, then out of the building, we noticed that the cafe offered ample seating, a large supply of electrical outlets, and ambiance music overhead. The cafe, on a busy weekday afternoon, was packed; nearly every seat was taken. People by themselves were either on their electronic devices doing what appeared to be studying, while people in groups were talking or studying. While most of the guests seemed to have purchased a beverage, many who were with their colleagues had either purchased a small pastry, or nothing at all; this led us to believe that the main objective of visiting the shop was not to consume a craft coffee beverage, but to utilize the gathering space offered by Starbucks. The coffee shop, for most of these individuals, had become a form of “third space”, or an area outside of work (or class) and home in which individuals have the opportunity to socialize, work, or relax (Thompson & Arsel 2004). We believe that college students especially see the value in this, as students utilize study space for classwork and group meetings at Michigan State. While college students are stereotyped for generally being “addicted to coffee”, the concepts, specifications, and influences behind coffee consumption go much deeper for students who drink coffee. By studying students at Michigan State University from an anthropological perspective, we are able to gain a more refined perspective on how college students in the East Lansing area navigate the activity of consuming coffee. The patterns and purposes of coffee consumption amongst our subjects can be tied to informal enculturation. We never observed people being told they should drink coffee to fit in, but rather a common understanding of the role coffee plays in life. Some people witnessed their parents having their daily cup while they would get ready for school and work respectively, and have gone on to mimic this behavior in college. Moreover, the language initiating coffee consumption is a commonly recognized as an agreeable catalyst for socializing. It is routine to suggest a trip to the local Starbucks to discuss personal lives, school, or business. The coffee shop is symbolic in MSU culture as a social plane, a place to meet, exchange ideas, study, interview, and more. 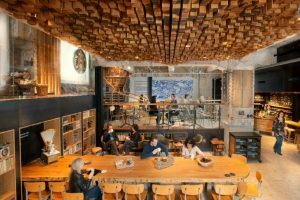 Rather than simply being a place to buy coffee, it holds a special symbolic value, assigned to it over years of influence from historical, economic, and cultural context. Most importantly, coffee is a deeply embedded part of many cultures, and for MSU students, the manifestations of consumption, sociability, and their associated anthropological components present an interesting view on how the relationships between students and coffee influences the role coffee plays in student life. Choi, Young Gin, Ok, Chihyung, & Seunghyup Seon, Hyun. “Evaluating Relationships among Brand Experience, Brand Personality, Brand Prestige, Brand Relationship Quality, and Brand Loyalty: An Empirical Study of Coffeehouse Brands.” Scholarworks, University of Massachusetts, scholarworks.umass.edu/cgi/viewcontent.cgi?referer=https://www.google.com/&httpsredir=1&article=1283&context=gradconf_hospitality. D’Costa, Krystal. “The Culture of Coffee Drinkers.” Scientific American Blog Network, Scientific American, 11 Aug. 2011, blogs.scientificamerican.com/anthropology-in-practice/the-culture-of-coffee-drinkers/. Eat at State. Starbucks Locations, 2018, eatatstate.msu.edu/campus-dining/starbucks. Gunnars, Kris. “13 Health Benefits of Coffee, Based on Science.” Healthline, Healthline Media, 15 June 2017, www.healthline.com/nutrition/top-13-evidence-based-health-benefits-of-coffee. Looijen, Ferdy. “Coffee: Just an Energy Boost or a Social Atmosphere?” Masters of Media, University of Amsterdam, 17 Oct. 2012, mastersofmedia.hum.uva.nl/blog/2012/10/19/coffee-just-an-energy-boost-or-a-social-atmosphere/. Papachristos, Andrew V., Smith, Chris M., Scherer, Mary L., & Fugiero, Melissa A. “More Coffee, Less Crime? The Relationship between Gentrification and Neighborhood Crime Rates in Chicago, 1991 to 2005.” Wiley Online Library, University of Massachusetts Amherst, https://onlinelibrary.wiley.com/doi/full/10.1111/j.1540-6040.2011.01371.x. Rosenbaum, Mark S., et al. “A Cup of Coffee with a Dash of Love: An Investigation of Commercial Social Support and Third-Place Attachment.” Journal of Service Research : JSR 10.1 (2007): 43-59. ProQuest. Web. 18 Apr. 2018. Topik, Steven. “Coffee as a Social Drug.” Cultural Critique, University of Minnesota Press, no. 71, 4 August 2018, www.jstor.org.proxy1.cl.msu.edu/stable/pdf/25475502.pdf?refreqid=search%3A9f4e523bbed976d581378d903f57712e. Vigneron, Franck, & Johnson, Lester W. “A Review and Conceptual Framework of Prestige-Seeking Customer Behavior.” Academy of Marketing Science Review, University of Sydney, 1999, pdfs.semanticscholar.org/1198/621feddeab59e59a95ae237c316bcb780bf3.pdf. Ward, Heather. “2017 U.S. Specialty Coffee Consumption Trends.” Specialty Coffee Association News, 3 Jan. 2018, www.scanews.coffee/2017/11/29/2017-u-s-specialty-coffee-consumption-trends/.